We have put the booth in NAPE (North America Prospect Expo) held in Houston during Aug 16-17, which is an extremely large exhibition for oil & gas deals held each year in February and August. 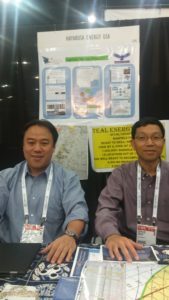 We shared the booth with Mr. Dongjun Fu, president of EnPower Resources Inc, an entrepreneurial startup whose strategy and current stage is very similar to Hayabusa, but with Chinese backing rather than Japanese. Hayabusa and EnPower are cooperating in many ways in acquiring 2nd asset.